Trump Slams Interest Rate Hikes, Ignoring Hands-Off Tradition Toward Fed Presidents usually don't comment directly on Fed policy. But President Trump broke with that tradition Thursday, saying, "I'm not thrilled" about the Fed's interest rate increases. President Trump looks on as his nominee for Federal Reserve chairman, Jerome Powell, speaks at the White House on Nov. 2. On Thursday, Trump said he is "not thrilled" about Fed interest rate hikes. But President Trump broke with that tradition, saying in a CNBC interview, "I'm not thrilled" about the Fed's interest rate hikes. "Because we go up, and every time you go up, they want to raise rates again. I don't really — I am not happy about it. But at the same time, I'm letting them do what they feel is best." 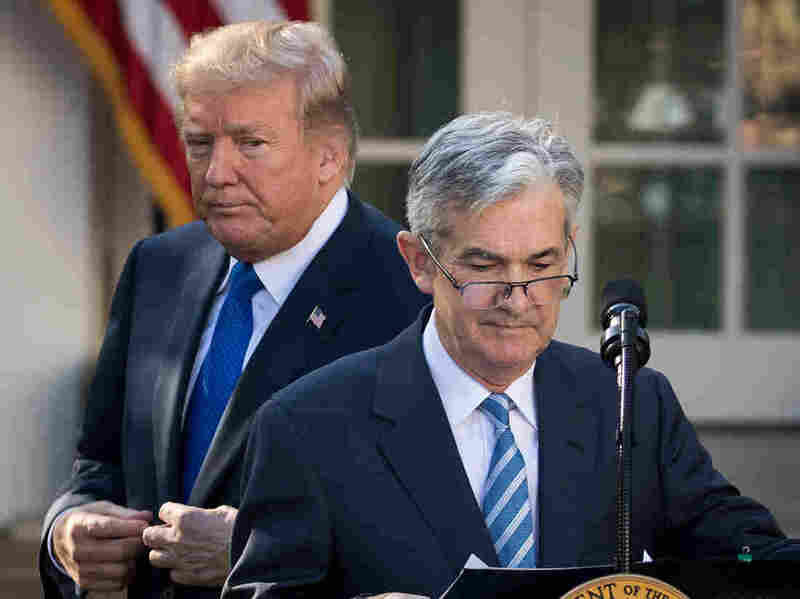 Trump also said Fed Chairman Jerome Powell, whom he nominated, is "a very good man." In a later statement to NPR, the White House said that Trump "respects the independence of the Fed" and that "he is not interfering with Fed policy decisions. The President's views on interest rates are well-known, and his comments today are a reiteration of those long held positions, and public comments." The central bank has raised short-term interest rates twice this year. It has signaled it will raise rates twice more in 2018. The president's comments come two days after Powell, in Senate testimony, raised concerns about the potential effects of Trump's trade policies. Powell said a protracted trade war with China, the European Union and other trading partners could hurt the U.S. economy. Last month, Larry Kudlow, Trump's chief economic adviser said he hoped the Fed would raise interest rates "very slowly." "We have a long tradition here of conducting policy in a particular way, and that way is independent of all political concerns. We do our work in a strictly nonpolitical way, based on detailed analysis, which we put on the record transparently, and we don't ... take political considerations into account. "I would add though that no one in the administration has said anything to me that really gives me concern on this front. But this is deep in our DNA. For a long, long time the Fed has felt it important to conduct our business that way. I'm deeply committed to that approach. And so are all of my colleagues here." Trump's comments about the Fed weren't the only time he has broken with tradition around making comments that could affect the financial markets. In June, he tweeted about the government's monthly jobs report about an hour ahead of the release, saying: "Looking forward to seeing the employment numbers at 8:30 this morning."